Anytime you may be speaking on a particular subject, you have to assume the audience is unaware of the details. It is up to you to explain those details in an unique and personal way. When you do that, then people remember and learn from you. Below are some good steps to follow in the development of your statement. We will use the Graphic Organizer below and read these two articles to form one argument that supports Tom Brady taking responsibility for deflating the footballs and another OpEd article that tries to show that we are not interested in punishing Brady because we are most interested in supporting and upholding a double standard. I will be using this article for my Devil's Argument. After I had finished both sides of the Graphic Organizer, I would spend time talking with other people about the topic and practice the delivery of my argument with respect to gestures and voice modulation for the greatest impact. Almost every week our students will be debating various topics in socratic circles in hopes of gaining a deeper knowledge on the importance of communication. The Socratic Seminar is directly correlated to the English Language Arts Standards under Speaking and Listening as well as Reading and Writing as outlined in the Common Core State Standards. The students will be notified usually a week ahead of time on the topic. 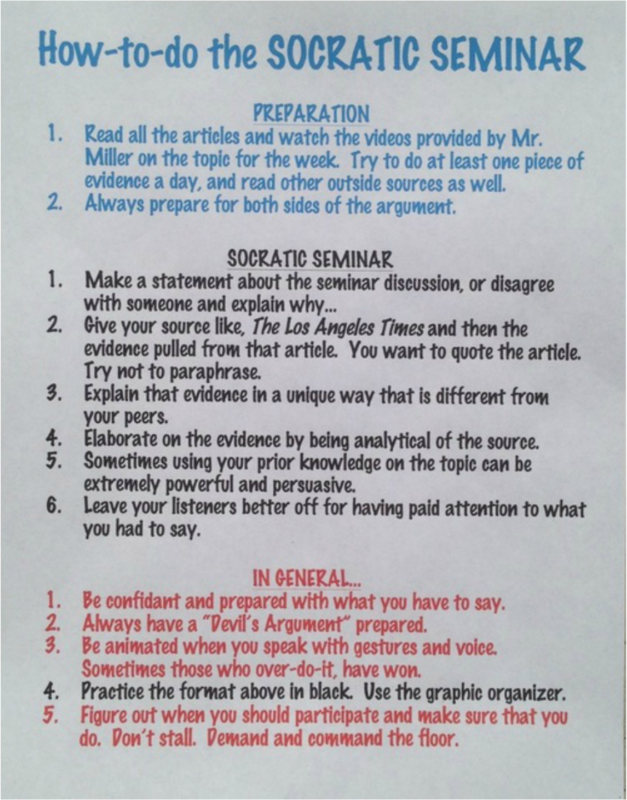 They should attempt the study of the topic early and utilize the Graphic Organizer for the Socratic Seminar. A completed and turned-in graphic organizer is expected before each seminar is to be discussed. 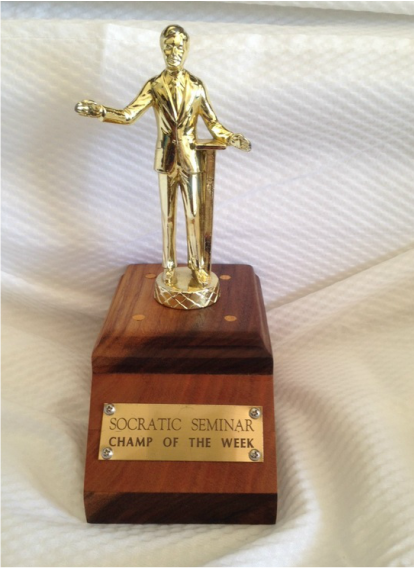 Those students who practice beforehand and talk about the topics with family members have shown great success in delivering their arguments, and students who have delivered the best argument for the day will be awarded with the title, Socratic Seminar Champ of the Week, and the trophy. The trophy will need to be returned on Thursday the following week. Is Shazam just a copy of Superman? Should the United States Armed Forces, or other countries, utilize marine mammals in combat situations? As we approach Play Monopoly Day on November 05, what is the best board game to play with family and friends? For this seminar, you will have to give a brief description of the game, tell us why it is your favorite, but most importantly PERSUADE US to go out and find the game to share with our own families this Thanksgiving break. Should consumers this holiday season purchase a "live" or freshly cut tree or an artificial tree? Which is the proper installation for a roll of toilet paper? Over vs. Under? 2. Are audio and video recordings better than reading books? 3. Which is the proper installation for a roll of toilet paper? Over vs. Under? 4. Does separating boys and girls help students perform better in school? 5. Do we react too quickly in passing judgment when it comes to social media? Especially when it comes to just a portion of the whole story? 6. Should hats come back into fashion for both men and women, and if so which particular "hat" should become the new fashion trend? 7. Should organized social dancing come back into fashion? 10. Is Shazam a copy of Superman? 1. According to NewsELA, football is linked to chronic traumatic encephalopathy (CTE). For this argument you can be a player (active or retired), a concerned parent, a fan, a coach, or even the NFL Commissioner with an argument to change the game or not. ​2. Which is more important: Talent or Hard Work? ​3. Should noisy dogs in the neighborhood be debarked? ​4. How can school districts, elementary through high schools, colleges and universities, and teachers help improve the advancement of females and minorities in the field of mathematics and engineering? ​5. Would you encourage your fellow classmates in picking and eating their own snot in the classroom given the recent study on the benefits to one's immune system? ​6. Is Santa Claus real? ​8. Do you think American drivers will give up their autonomy for self-driving cars? ​10. Is the hot dog a sandwich? 1. Should the state of California make available for students at school to have more options for mental health while attending school? 2. Do "public service announcements" really work with special attention to the recent John Cena video on what it means to be an American and patriotic? He says, "To love America is to love all Americans." 3. Should Sea World ban the use of killer whale performances and put a ban on their breeding for captivity program? 4. Should circuses like Ringling Brothers and Barnum and Bailey stop using animals like, elephants, bears, and tigers, as part of the entertainment at shows? 5. Should zoos and aquariums start phasing out some of the larger predatory animals like, gorillas, polar bears, elephants, and lions, that require much larger habitats? 6. Should high schools adopt POP protocol, so that the incidents between the public, especially drivers and people in general, and law enforcement can begin to be reduced dramatically? 7. Should children under 14 years old, freshman in high school, be banned from social media, like Facebook, Instagram, Snapchat, etc...? Facebook does have a policy of no children under the age of thirteen. We will read an article from Redbook Magazine in class before discussing. 8. Should prisoners receive better wages in prison for work completed as well as benefits? 9. Could the "Betsy Ross Flag" be interpreted as a symbol of oppression for some, and as it seems to be newly adopted by some racist organizations, could it therefore be interpreted as a symbol of white supremacy? 1. Should "amazon" and other delivery services offer drone deliveries? 2. On March 09, 2016, the city of Los Angeles began sweeping up the "popular" tiny house solution that was masterminded by former homeless man turned problem solver, Elvis Summers. Should the city of Los Angeles remove the houses from these individuals before having another viable option available to help end homelessness in the city? 3. Should the state of California place a tax on junk foods? ​4. Should drivers have access to their smartphones while driving? 5. Do you think the new "hoverboard" is a better ride or experience than the original skateboard? 6. Should the sons of Dr. Martin Luther King sell their father's Nobel Peace Prize and Bible? 7. Do you believe that the science involved in cryptozoology is a valid field of study? 8. Should Female Ranger graduates be allowed to take their expertise into combat? 9. Should the owners of professional sports programs and fans stop using Native American imagery? ​10. You are the Athletic Director of a major university and a coach on staff has embarrassed the university dramatically. Do you fire the coach? 1. Do violent or inappropriate video games, movies, or TV shows trigger violent or inappropriate behavior in children? 2. Underage children are required by the state of California to attend school, but there are some who believe school attendance should be voluntary. What are your thoughts? 3. Should companies advertise and market goods to children? Take into account the article: "Bestseller in MidEast: Barbie with a Prayer Mat," when developing your statement. Also consider the profits made by Disney in marketing the movie, Frozen, as well as merchandise which has generated over two billion dollars for the company. 4. Our first amendment right protects us as people from Congress possibly passing a law that might infringe on my freedom of speech or of the press, so should their be a limitation on freedom of speech, or should I have total freedom to say what I feel? 5. Is television better than reading books? 6. Define what it means to be an American? 7. The New England Patriots were accused of deflating the football in the AFC Championship Game win against the Indianapolis Colts, and supposedly an attendant or ball boy may have had some impact on the deflation. Should Tom Brady, as having had the final say on his choice of game balls, have taken responsibility for the deflated balls? 8. There is a lot of research out there on the benefits of animals and their caregivers. Some individuals suggest that schools would benefit from opening their doors to having more pets at school. Should schools have therapy dogs and pets at school? 9. Should citizens of the United States of America be fined for not exercising their right to vote? 10. Should high school students be expected to pass a citizenship exam, a battery of basic test questions covering topics on the Constitution, ones rights as an individual, symbology of the country, and basic historical facts about the founders and contributors of the United States of America, in order to graduate from high school?